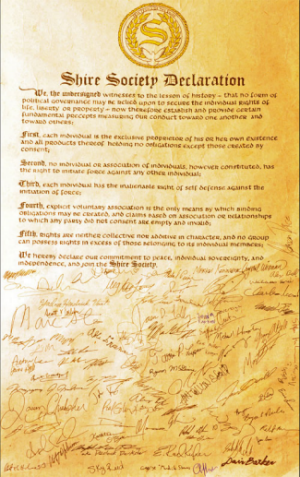 I , Brian-Keith Henderson(sui juris) do hereby make a Pledge and do autograph The Shire Declaration! This is the most beautiful document that I have ever read in my life. Been listening to LRN like the things they talk about. Robert Hubbard, electronic signature of the Shire Dec. page. Signed, a printed copy at Cheshire fair, came across it going through stuff, so here I sign digital and continue to declare my sovereignty as I further my quest for peace and unity, I live under Gods laws , not Mans , I abhor FDR act 1933, and nothing can ever be taken away from me with out my consent, I am Free of all of Governments, and I am a sovereign son of God! Signing under the birth name given to me Paul Joseph Keller Jr., And the Name I am called Pauly and the name I am AKA TWSTA ( The World System Transmitter Associate ) And Another Name I am AKA TWIST simply for my ability to Twist , untwist and Flip words and things in ways that leave uneducated fools scratching their heads. From this point on I live my Life according to The Old testament The book of Acts and Walk freely through this world harming No one , And will be Accepted by everyone, I am Humble , Kind , Trustworthy, and A Son, Brother, Father, Grandfather (Aumpah ) Friend to all. And answer Only to God Our Father, And will be Accepted by all as Such! So it is Written , and So it IS ! Hmmm…I signed this over a year ago but do not see my signature. So I’m signing again! I agree and sign this wonderful declaration. Robert William Jr.: House of Woodhall; self aware living man. If “we” really and truly honored and performed the above statements in our daily lives, we would have no need for websites like this! But, since good and evil minded men and women co-exist together in this world, we (who desire to live in harmony) must come together and find a common bond, which is nothing more than the desire to be “FREE” men and women from the tyrannical notions and motives of oppressive psychopaths!! Let freedom ring!! Thom [Más] Potter, Hemet, CA. Like heating a Korean house, we start with the floor. I am in agreement with this declaration. The only way we have a chance at a nonviolent, deeply peaceful society is to embody nonviolence every day. I embody nonviolence and anarchy in my life everyday, and can’t succeed without my community. I am humbled by The Shire’s work and our community. Soon I will be in The Shire, and peace will emanate from within. Nothing can shake me, nothing can shock or disrupt this peace. I pass it on to those around me. They can threaten, hurt, abuse or even kill us, but they can’t get all of us or our descendants. I am here not for revolution- to repeat the mistakes of the founding fathers- but for resolution. I am here for radical, peaceful coexistence. I am planning on visiting New Hampshire in July week of 18-23 thereabouts. Joel Evangelist. Our Federal and State government officials cannot be trusted. Time for a change. Love this declaration. Confirming this, my sacred vow. Separate by geography and together in spirit, I hereby sign without reservation. 1 God, NO masters. We are legion. Expect us. By the way, I grew up in mass, and dreamt of owning a home in NH. If it’s become inhabited by people like all of you, who REALLY NEED to get a friggin’ clue, my dream has been killed by every one of you. DO NOT respond to this msg until you have seen what’s REALLY HAPPENING in life, and are WILLING TO ACCEPT it is true. That’s when you can respond out side of unknowing ignorance. Here’s to education and revived dreams. Your posted blog attempts to operate within the current establishments laws and procedures by doing so you are consenting to be bound to them or presuming they are applicable to you. All I will say on that matter I’d the deck is stacked against you and if you find a loophole they change the laws and procedures as loopholes are discovered. Only another psychopath can think he can beat a psychopath at his own game. The current system relies on your presumption of applicability and your fear of your own mortality to uphold their laws. What is being declared here is an independence from that system predicated on the principle of do no harm, cause no damage and that nothing is binding without consent. If everyone agreed to your demand they would simultaneously be contradicting this declaration. I sure as hell hope someone has my back next time i get cuffed to a chair with a spit bag for all of holding to see. Oh yeah sleeping in the grass intoxicated, against the law? Ps. I love the control you guys have but one day we might really have to stand together. Separate by geography (I’m in Italy) and together in spirit, I hereby sign without reservation. Robert DeMott It seems this is the way I have always tried to live my life. Do not do any thing to any one you do not want done to you.